CGN and EDF Energy are committed to ensuring local people benefit from the skills and employment opportunities the Bradwell B project could bring. During its operating life, Bradwell B could bring significant investment into the local economy every year. The construction and operation of Bradwell B could create thousands of employment and apprenticeship opportunities in a broad range of occupations and careers. To provide an example of the benefit that Bradwell B could deliver to the local area, please see below to see how companies in the South West have now won contracts worth more than £1.3 billion for the Hinkley Point C nuclear power station in Somerset. 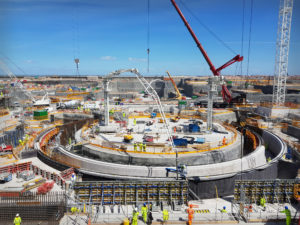 New figures released by the Government show that companies in the South West have now won contracts worth more than £1.3 billion for the Hinkley Point C nuclear power station in Somerset. The updated totals show that £650m has already been spent with the region’s businesses. The figures are reported in the “Hinkley Point C Wider Benefits Realisation Plan” published by the Department for Business, Energy and Industrial Strategy (BEIS). It can be read in full here. The plan sets out how the project is creating opportunities for local companies and workers, as well as helping to reinvigorate UK industry, enabling British companies to compete for nuclear contracts across the world. It also underlines the nuclear industry’s commitment to bring down costs – a commitment made in the recently published Nuclear Sector Deal – something that is possible now that the investment to restart the nuclear new build industry has been made at Hinkley Point C. Many costs at Hinkley Point C would not need to be repeated at the proposed near-identical follow-on station at Sizewell C in Suffolk. BEIS also recognises the importance of an innovative funding model at Sizewell C to reduce costs for consumers. Combining forces has been a key part of the success of South West firms, with several forming alliances in order to compete successfully in scale and expertise, with the backing and support of Somerset Chamber of Commerce. Chris Langdon, Interim CEO of Somerset Chamber of Commerce, said: “The mission, led by EDF Energy and championed by Somerset Chamber, to develop an industrial legacy for the region of improved capability, competence and competitiveness from this large infrastructure project is starting to bear fruit. Over 3,200 people are working at Hinkley Point C each day, with some 1.5 million hours worked every month. The South West is set to benefit by £200 million each year during peak construction, with £4 billion being generated for the regional economy over the lifetime of the project. With more than 80% of contracts awarded, the project is on track to spend 64% of the construction value of Hinkley Point C with UK-based companies, up from the original estimate of 57%. It is expected that 25,000 people will work on the construction of Hinkley Point C, in a broad range of occupations and careers, and it will provide around 900 jobs throughout its 60-year operational lifetime. Opportunities include: construction, civil engineering, electrical and mechanical installation, skilled welding, commissioning, project and commercial management, hospitality and catering, logistics, security and site service and other support roles.